It is just as important to conserve water OUTSIDE your home as it is INSIDE your home. Lush green lawns, bright colorful flower gardens, bountiful vegetable harvests —these add beauty and enjoyment to your home. But grass and flowers and vegetables require water, and they can sometimes consume massive amounts of this precious natural resource. So how can you water wisely? How can you conserve water in your yard? DIRT: The right soil will help you make the most of the water you use. Nutrient-rich soils actually HOLD the moisture in the soil, so adding nutrients and organic matter (such as compost and worm castings) to your soil will help the dirt retain the moisture it receives. Once you’ve planned and prepared your yard to need less water, now you’re ready to water that garden, but water it wisely. Don’t water unless it’s needed. This might seem obvious, but it’s a good reminder. So check the weather and check your soil. Another way to check your soil is by using a moisture meter, an inexpensive tool which checks moisture levels in your soil. This moisture meter actually checks moisture, pH levels, and sunlight. —Collect rainwater. Installing a rain barrel or water tank can utilize water from your roof and gutters and put it to work in your garden. —Reuse household water. Save your cooking water (from boiling vegetables) and use it in your garden (extra nutrients!). Put a couple of buckets in the shower while your water is heating up, and use this water in the garden. Bath water, fish tank water, any “used” water from your home —let it do double duty in your garden. All of these methods will help you use water wisely in your lawn and garden, so you can eliminate wasteful practices and enjoy the benefits of a beautiful, healthy landscape. The Guardian. Six Ways to Save Water in your Garden. The Micro Gardener. Ten Water-Saving Tips for your Garden. Love your Landscape. 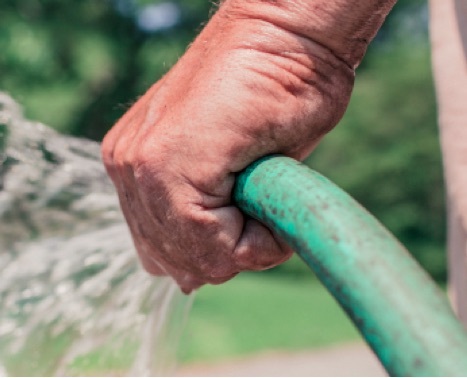 10 Easy Ways to Save Water in your Yard and Garden.